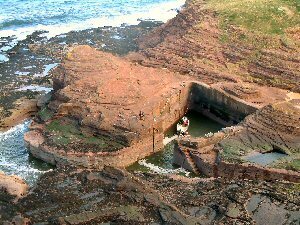 Seacliff's claim to be the UK's smallest harbour is indisputable. Measuring no more than 12 metres along its longest side, and an entrance barely two metres across, this is the original one-man, one-boat harbour. It is blasted out of the Gegan Rock, the promontory overlooked by the imposing ruins of Tantillan Castle. Land access to the harbour is only possible by tramping across a sandy beach, then jumping over rock-pools. But once you have found it, its charm will hold you there as long as the weather permits. The harbour was originally constructed in 1890 by Andrew Laidley, the then owner of the Seacliff Estate, by using a steam engine and compressed air to cut the stone. The harbour was once busy with small cobles working stake nets for salmon off the River Tyne. The tiny harbour is now used by a local crab fisherman. His boat, the Secret Garden is usually moored there, on a system of pulleys and weights to prevent it from hitting the vertical sides of the harbour in the ever-present swell. Its unique position, away from the main shoreline, ensures that it never dries out. Indeed, at high tide, there is more than six metres depth of water in the harbour. For lovers of small harbours, a visit here is a must. Access by car is off the A198 at Auldhame, about four miles east of North Berwick. Follow the private lane through the woods (you may have to pay a fee) to the beach car park. Then head up the coast by foot, across the beach to the Gegan Rock. Look out for the lobster pots that litter the harbour rim. For the bird's-eye view, climb the cliff opposite (from where the photo above was taken). The Seacliff estate remains in the ownership of the Dale family, as it has since 1919.